In this Mythbusters article I’m going to touch on something that’s been discussed before. It may be somewhat of a rerun but given the incredibly common practice I think it’s due time. Myth – It is safe to place your infant seat on the top portion of a shopping cart, especially when it clicks into place. Many people view this as truth because, well, everyone does it. Surely if it is that awful and dangerous then you wouldn’t see every infant in the store chilling in their car seat on the cart every time you go to Target, right? Plus it clicks in! It’s meant to be placed there! This next paragraph may be a total spoiler but I suspect you already know the answer anyway since I’m running a blog post on it. According to the Consumer Product Safety Commission (CPSC.gov), between 2008 and 2012 there were approximately 107,300 shopping cart related injuries treated in kids under the age of 5. Of these cases, 85% were head/facial injuries. The American Academy of Pediatrics shows that, between 2003 and 2007, approximately 43,562 infants were treated in emergency rooms for being injured while in a car seat that was not in use in a vehicle. 84.3% were head injuries, the majority of them being due to either the infant falling out of the car seat or the car seat falling from an elevated surface. I know the following scenarios are disturbing to imagine, but I feel like they will illustrate how easy this can happen to anyone. Case 1: You just wrapped up grocery shopping. Your baby is snoozing happily in his infant seat on the cart. You’re pushing the cart through the parking lot to your car and you cruise over a speed bump. The infant seat that clicked perfectly into that spot on the cart 30 minutes earlier pops off the cart and topples to the ground. Your sweet baby slams head first onto the pavement from 4 feet up in the air, with the additional weight of the car seat on top of him. Case 2: You’re shopping at Target with your newborn and your crazy toddler. You have your baby in his car seat on the cart but you ALWAYS have one hand on him. Except when your toddler knocks off some containers of baby puffs from the shelf on the floor. You bend over for just a second to pick them up. Your toddler wants to kiss your baby’s feet and pulls up on the cart handle to reach. The cart tips over and the baby goes face first onto the concrete floor, cart on top of him, not to mention the crush your toddler is going to get too. Sadly, I didn’t make those up. If you want to spare yourself the nightmare, please use the car seat IN THE CAR. Not outside of it. I know it’s handy when they’re napping, but it’s just so easy to temporarily sit them on a counter, a table, or a shopping cart. Yes they make little docks on shopping carts designed for infant seats, but shopping carts tip so unbelievably easy that it’s just not worth the risk. If you need to place a car seat in a shopping cart then place it in the big part of the cart. I know that defeats the purpose of the cart, but that’s really the only solution here. Obviously this myth is busted. Break the cycle and share with those you know. Your kid is going to have plenty of opportunities to get hurt…here’s one you can avoid. If it were possible, toddlers shouldn’t even sit in the front. I had my nephew in the front spot – he was about 18 mons – and I was pushing him back out to the car. Put my foot on the bar and leaned into him singing (or whatever silly thing we usually did that day) and the cart, being empty and light, popped a wheelie and fell forward, crushing his leg under me and the cart. Broke it. It was awful. The cart is built back heavy and high for groceries, not kids. If they were redesigned like those playcar carts only for babies and toddlers and make them lower, it might be a lot safer. Moms cannot be expected to “leave the kids at home” if she’s a single mom, a stay-at-home mom or a working mom, trying to get things done. OK NOW WHEN DID THIS ONE START ???? I HAVE FOUR CHILDREN AND A BIG FAMILY AND HAVE NEVER WENT ANYWHERE WHERE PARENTS DONT ALL DO THIS. I ACCIDENTS ARE GONNA HAPPEN, BUT I HAVE NEVER HAD ANYTHING HAPPEN FROM THIS OR KNOWN ANYONE WHO HAS. JUST HAVE COMMON SENSE AND KEEPS CHILD STRAPPED IN FOR ONE, AND STAY WITH THEM AT ALL TIMES AND THERE YA GO.BYNOBODY SHOULD BE TELLING ANY PARENT NOT TO DO SOMETHING ESPECIALLY AN EMPLOYEE. ITS ALL ABOUT POWER AND CONTROL TODAY. EVERYONE IS A KNOW IT ALL AND JUDGEMENTAL. IT IS RIDICULOUS HOW OVER SENSITIVE, PARANOID, AND DRAMATIC THIS WORLD HAS BECOME. PEOPLE SHOULD MIND THEIR OWN BUSINESS OR ACTUAL BUILD EACH OTHER UP NOT CRITICISE THEM FOR EVERYTHING. BE HELPFUL AND KIND NOT ARROGANT AND PUSHY. November, no one is saying to be arrogant and pushy. Just like anything else in parenting, the more you learn, the safer your children are. But if you get defensive and closed off because you feel you know everything because you have a large family, and have never seen a child get injured (I’ve never seen a child fall out of a cart either, but that doesn’t mean I don’t think it can’t happen), you shut yourself off to learning. Children are quick, parents are distracted in stores–that can lead to a bad situation. Reduce your child’s chance of injury by not placing their carseat on top of the cart. If you weren’t aware of the risk, wouldn’t you want to know? 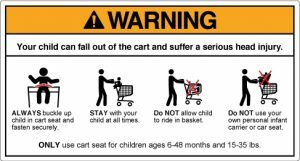 This is why it’s so important for parents to actually read the car seat safety manuals and pay attention to the warning signs on carts. I work retail, and I can only imagine the hell that would be raised if an employee tried to correct a parent in this way. A lot of parents think they can do no wrong and get insanely defensive if anyone tries to correct them about anything. I know I’ve tried to help people out with a “Hey, ya know, this really isn’t safe” before… and nearly had my throat ripped out. Sorry for starting a “mommy war” and trying to keep your kid, oh, what’s the word… ALIVE. 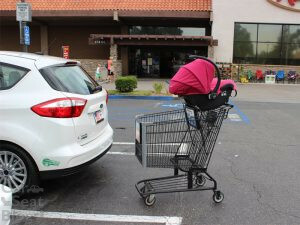 Honestly, I hated putting my son’s carseat on the shopping cart like that but I could not do my shopping another way especially with two kids. A baby and a toddler who thinks it’s funny to run away from mommy. I only have two hands, and can only do so much. Trying to compete a shopping trip as fast as you can, while making sure your kid doesn’t run away, doesn’t take anything, and making sure they are both safe and happy so they don’t scream the whole store down is a huge task. I hated going shopping. And I agree it’s not safe to put carseats up there but what can a parent do when they have no other option. Get parents a safe cart in which they can at least put two young kids in and then there will be less accidents. Not sure how old your kids are now, but the better option is to put the car seat in the big basket of the cart so it can’t fall out. But I understand.. parenting is tough and shopping with kiddos is hectic. Exactly, then you would be getting looks for your kids being out of control. They know this and if its not one thing its another. People just want something to complain about. As a new mom I had seem lots of other women pushing their kids car seat on top of the cart. I had to make a run to target one day when my twins were 5 months old. I used a babycarrieecarrier to carry one on front, and the other I had in his car seat on top of the cart. I wasnt able to wear both babies at the time because I didn’t have the right kind of carrier for two. We made it fine into the store, but on the way out the wind had picked up and I was pushing the cart into the wind. The cart started turning towards the edge of the sidewalk and into the street. I had one hand on the car seat and the other on the cart. I could NOT steer the cart with one hand, and I knew if i let go of the car seat my baby would be thrown into the street. Thankfully an employee saw me struggling and pulled the cart the rest of the way to my car as I pushed it and hung onto the baby. One of my babies nearly died that day. I wish I had known sooner that it is NOT safe to put car seats on carts. Just a quick note, most people only read the title of articles. You might want to switch the title from “It is safe…” to “Is it safe?…”. So, I’m childless and in my early 30s. This is the first I’m hearing of this phenomenon. I can’t imagine any 16 year old cashier yelling at an adult to not put their kid there. Sue happy? There are parents who would sue the store for telling them what to do with their kid. So, no, it’s your own responsibility. I don’t understand why store employees don’t tell customers not to do it. I think it could so easily be stopped if store employees told customers it was not safe and not allowed in the store. They tell you other things but have never heard that. Are you serious? It’s not the store employees responsibility to tell you how to take care of your child! 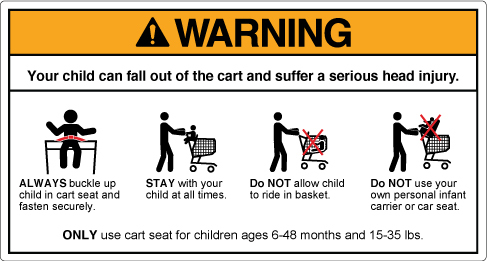 Our constantly repeated store warnings only mention to buckle your child and never let them ride in the basket. Nothing about not putting seats on or in carts. It’s BRU. We have probably a lot more babies than anyone and should say something. On the other hand, in 8 years I’ve seen a few kids nosedive out of baskets, never seats off carts. On the third hand, that doesn’t mean I won’t see it today or tomorrow or next week :/. I have seen plenty of employees tell parents not to let their older children ride/hang on the sides of the cart, but I have never seen any tell a parent that putting their car seat up on the seat portion of the cart was dangerous. Well why not? My local store every employee seems to think it’s ok to comment about my baby wearing and how much more comfortable the kids would be in the cart. I know this holds no merit to the article, but employees voice their unsolicited parenting advice about other things. But putting the seat on top of a cart has become so normalized that no one really bats an eye until they see something bad happen. Even though the warning labels are right there. I totally agree it is not the stores responsibility to tell customers how to place their children that is just annoying! I have been warned by a store employee. I actually already knew, and was wearing my baby actually. But the employee of the store had recently seen a car seat fall off a cart with a newborn in it, and was making a point to warn every parent she saw in the store with an infant. The reason some employees do not say anything is because sometimes parents feel threatened and offended that you are telling them they are doing something wrong. I work in a baby store and I can’t tell you how many times I have seen this and many other things. Depending on the customer and my interaction with them I will approach them nicely and let them know. Sometimes depending on how you approach the situation will depend on the outcome. If every time you say something that parent tells you to mind their own business you are less likely to say something the next time. Another reason is the employees simply do not know they shouldn’t put carseats on the top of the cart. Really lady?? Do you think that employees have time to tell you something that is “common sense”? I think that employees don’t because it’s mostly retail places that have shopping carts and retail employees don’t get paid enough to care. If it comes back on the store, again, they don’t really care. I speak from 4 years retail store experience. We had a mom who let her kid stand on stools and shout at the top of his lungs, and I hate to admit it but I think most of the employees hoped that kid fell. I used to work at a retail store, am also one of those people who talks about car seat safety with everyone who will listen. I had a nurse tell me that she won’t use the carts with the seat on them designed to hold a infant car seat because it’s not safe and since the car seat clicked in it was safe. I explained that even in the manuals that it says not to put the car seat on the cart and that it may sound like it is clicked in, but it will come off once the cart tips over. She repeated that she is a nurse and since I am a retail employee that I cannot have enough knowledge to be able to tell her whether it was safe or not.